Almost 10,000 men, women and children have nowhere to call home, the highest number of people experiencing homelessness in the history of our state, so we very much need your help. 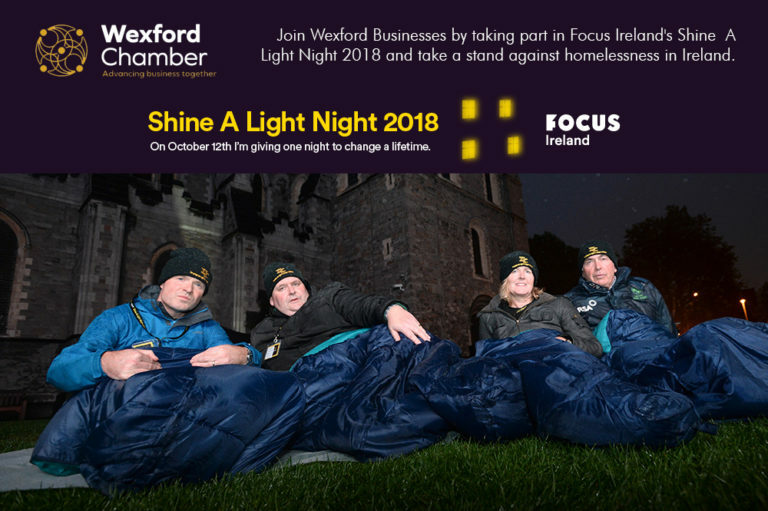 Please join Wexford Chamber, our members and the local business community in Focus Ireland’s Shine A Light 2018 and take a stand against homelessness. Shine a Light Night, which takes place on 12th October 2018, will see employees from companies across Ireland join in solidarity with the nearly 10,000 people experiencing homelessness today by sleeping-out for one night and raising funds for the vital work of Focus Ireland. This year Focus Ireland, who organise the event, have made getting involved even easier as companies can sleep-out in Innovate Wexford Park, or they can organise their own sleep-out at their own place of work with support from our expert team. The funds raised from the companies that took part in 2017 were crucial in supporting Focus Ireland help 700 families to escape homelessness and move into a home of their own. That’s 700 families whose lives have changed forever; who can now wake up on Sunday morning and cook breakfast together in their own kitchen. Since 2012 over €3million has been raised through Shine a Light Night to support the vital and life changing work of Focus Ireland. Over 600 Business Leaders have slept-out along with 1,000’s of employees in companies up and down the country. Focus Ireland are working with people every day to end homelessness for them and for their family. Watch this clip from Each & Other to hear how everyone in their team gets involved, even if they can’t sleep-out on the night. This is a truly special night to be a part of; We are calling on Wexford Chamber Members and the local business community to consider taking part this October 12th – please sign up today! Please sign up today or send an expression of interest to Focus Ireland by e-mailing cathryn.oleary@focusireland.ie , alternatively you can call Cathryn at 086 6042854.